The Director and studio heads in charge have been bickering for months about the biblical film ‘Noah’ being significantly over budget. But that hasn’t stopped Paramount Pictures from dropping $4 Million Dollars on a Spot during the Super Bowl. It’s predicted that the film will need to clear $200 million dollars to even make a profit. Christians don’t care, the large contingency would like to know if there’s any ministry at all in the film? Or will it be full of special effects aimed at bringing in secular audiences with little biblical accuracy. Early test audiences for the film were mixed in their reviews. The film which hits theaters on March 28, will not be the only movie vying for attention on Super Bowl Sunday. A commercial for Michael Bay’s “Transformers: Age of Extinction” will also play. 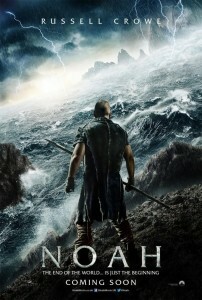 Russell Crowe, Jennifer Connolly, Emma Watson and Anthony Hopkins all-star in director Darren Aronofsky’s blockbuster. This entry was posted in Reviews, World News and tagged Commercial, Emma Watson and Anthony Hopkins, Jennifer Connolly, movie, Noah, Russell Crowe, superbowl, trailer, video by Kris Patrick. Bookmark the permalink.